Our unbelievable team of stylist’s at Serenity Salon provide our clients with the greatest cuts and latest styles. From highlights to retouches, Serenity specializes in state-of –the-art hair coloring. Book an appointment today! Our nail techs can do it all. Try one of our pedicure packages or a full acrylic nail set. In a hurry? Stop in for a buff and polish and leave looking and feeling great! It’s the extras that set Serenity apart from the rest! Our eye lash extensions are unmatched. Ask about our LOX Extensions and treat yourself to a beautiful change. The Serenity Signature Haircut is a luxurious experience. Call today and book with one of Serenity’s expert stylist’s! The Serenity Pedicure offers a relaxing and refreshing experience. Come and get comfortable in our nail salon, where you will be treated like royalty! “Everyone is very nice and the services are great! I have been coming to Serenity for a few years!" "...finally, someone who gets my hair!" 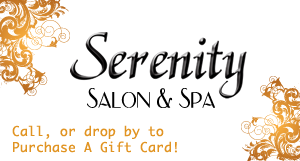 Serenity Salon is a premier full service salon located in the Five Parks shopping district in Arvada Colorado. 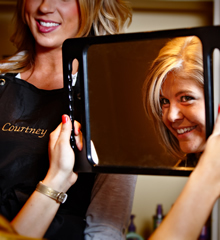 Our salon is a full service salon dedicated to providing you with the utmost attention, courtesy and level of service. Our salon is an escape into a world of comfort, relaxation and rejuvenation. 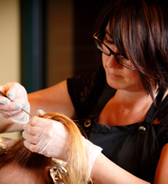 Our staff is comprised of highly trained stylists and beauticians. As a Redken certified salon, Serenity works by a set of exceptional standards to ensure the most advanced coloring and cutting techniques. Don't Leave your appearance to any salon, you deserve the best!